Do you remember that feeling as a kid when you walked into a gas station candy store and set your eyes on that Charleston Chew...or the Snickers bar...or the entire row of Jolly Ranchers flavors? Mind blowing excitement! This same overwhelming emotion now hits me as an adult, when discovering the leather jacket of my dreams. I mean lets be honest we all want more than one amazing leather jacket in our wardrobe but finding that one that makes your heart skip a beat is pretty damn special. 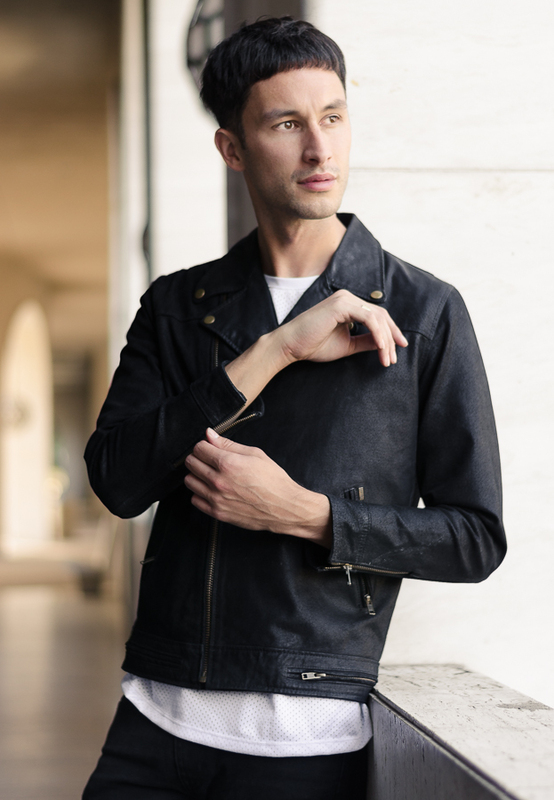 Enter stage right: this black leather jacket created by Obey clothing. The fit. The feel. The detail. It's all happening with this jacket. Check out the zippers, the construction of the shoulders, arms and waist. IT FITS LIKE A GLOVE. Obey Clothing was formed in 2001 as an extension of Artist Shepard Fairey's work. The clothing is known as more of a Skater/Surfer clothing brand but they have really taken their design to a whole new level over the last couple years, appealing to a wider audience. "The clothing is heavily inspired by classic military design, work wear basics, as well as the elements and cultural movements Shepard Fairey has based his art career on. Through designers Mike Ternosky and Erin Wignall, Shepard works to create designs that represent his influences, ideals and philosophy."